"How did the universe form?" "How did the sun and the moon begin to exist?" "Where were you before you were born?" "How did the seas, trees, and animals come about?" "How do the colourful and lovely scented fruits that we love, such as bananas, cherries, plums and strawberries, emerge from the dark soil? Who gives them their colours and scents?" "From where does the tiny bee learn how to make such tasty honey? How does he make a honeycomb that has such smooth corners?" "Who was the first human?" "Your mother gave birth to you. But the first human couldn't have had a mother or a father. So how did the first human all of a sudden appear?" In this book, you will learn the correct answer to all of these questions. Do you know what this correct answer is? Everything that you see around you, including yourself, your friends, your parents, the earth, the sun, the food that you love, bananas, cherries, strawberries, colourful roses, violets, beautiful scents, human beings, cats, dogs, ants, bees, horses, birds and butterflies, in short everything was created by Allah. We asked you, "Did you ever think: from where does the tiny bee learn how to make such tasty honey?" Well, Allah is the One Who teaches the bee how to make honey. But there are those people who tell stories about these things. 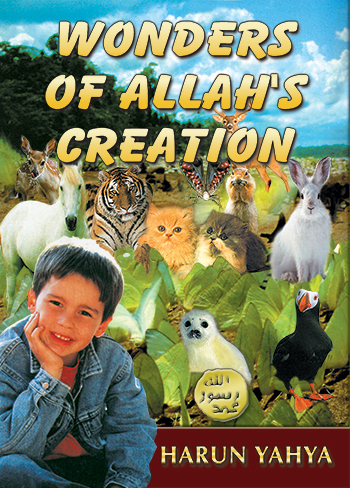 They don't believe that Allah has created everything and they invent stories about it. These people are called "evolutionists" and the story that they tell is called "evolution". We want you to learn what is the truth, and that is why we have started by telling you the right things. In the second part of the book, we will show you how those who believe in evolution deceive people. If after you have read this book, someone comes up to you one day and asks you to believe in the theory of evolution, you can then tell him that the theory of evolution is not right, and Allah is the Creator of everything. You can read Harun Yahya's book Wonders of Allah’s Creation online, share it on social networks such as Facebook and Twitter, download it to your computer, use it in your homework and theses, and publish, copy or reproduce it on your own web sites or blogs without paying any copyright fee, so long as you acknowledge this site as the reference.